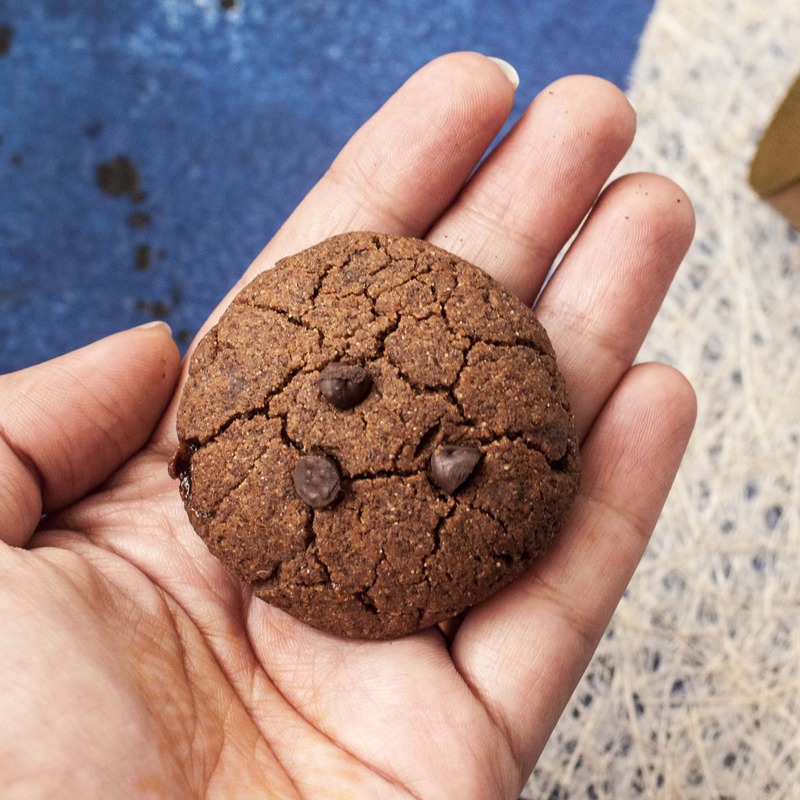 Healthy Double Chocolate Chip Ragi Cookies.The name is almost a conundrum right? It should instead be nutritious Double Chocolate Chip Ragi Cookies. Added Bonus-These are Eggfree and take 15 minutes to put together including the time taken for baking. What is Ragi / Finger Millet? Ragi is a millet which has been touted as the super grain of india when infant its a very ancient grain which has been cultivated from centuries.It is quite a staple in the southern part of India.Its used extensively in Karnataka in making dosas, flatbreads and Muddes(ragi balls) along with sambhar and chuteny. It has a lot of local names in India- Its called Nachani or Mandua in the North India,Kezhvaragu in Tamil Nadu. It is a very small brown grain and because its too small to be polished or processed its usually consumed in its most natural form.It’s one of the first foods given to babies in the southern regions of India because of its high nutritious value.It’s an excellent source of natural Iron and Calcium and because of its low glycemic index it also controls diabetes.It’s known as Nachni or Finger millet in other parts of India. Finger Millet is a difficult grain to bake with but the health benefits are such that you want to incorporate this grain in your daily diet.Usually baking with Ragi results in a very sandy texture which crumbles the minute you bite into it(in a bad way).The taste is also not very palatable.Read more about millets and how they compare with wheat and rice on my how to introduce Millets in our diets. But these cookies are not the second rated option you have to adopt in the name of health.These are as delicious as they are healthy. Crunchy on the outside and soft inside.Perfect for those lazy chais in the balcony and more importantly for your Childs tiffin boxMy child doesn’t go to school yet but if and when he did I am sure these along with these Healthy Cheese Muffins & Healthy Chocolate Bliss Balls will be in my everyday snack tiffin. What can be used as an alternative to Jaggery to make these Healthy Millet Cookies? You can use jaggery, palm sugar or coconut sugar.The jaggery acts as a binding agent for these cookies so its important you don’t substitute it with refined sugar.Using coconut sugar gives it a dark decadent taste which enhances the chocolate in the cookie and if you can get your hands on it then its a better option. You need to use fresh ragi flour for this.As Ragi is unprocessed, the shelf life of the flour is very less, less than a month, hence its imperative that your flour is fresh. The other important point of make or break is in the dough.It should be pliable and sticky enough to make soft balls.If your dough isn’t coming together but instead is very crumbly then either the butter-jaggery mix was too hot when you mixed it in or it just needs a little bit more milk. Only difficulty while making these cookies are ,that they burn easily so you should be on a lookout for them from the 8th minute in the oven. You can make these cookies even more nutrient rich by adding almonds and walnuts to it.Soft dried fruits like dates, cranberries and raisins will also work very well in this recipe. from amazon once every month.If you are based out of Bangalore Healthy Buddha Organics is also a great option for organic produce. Eggless, Easy & Healthy Double Chocolate Chip Ragi(Finger Millet or Nachni) Cookies. In a saucepan ,heat the Jaggery and Butter together till its all liquid and all the jaggery lumps have dissolved.Add the Milk too.IMPORTANT-Do not Boil & Let this mixture cool down. In another bowl Mix together-Ragi flour,wheat flour, corn flour, cocoa powder, cinnamon Powder and Baking Powder. Slowly add the butter jaggery mix into the flour mix.Use a spatula to make a soft dough. Last add the chocolate chips. Make small balls and place on the cookie sheet/tray lined with parchment paper.Lightly press the cookie down. Bake in the preheater oven at 180 degrees for 10 minutes till you see cracks on the cookie. If you don't have parchment or baking paper lightly butter the tray you are using for baking. These cookies don't spread or rise much so the shape you put on the sheet while baking will remain. These cookies will Harden once out of the oven. Thankyou Spoorthy for the incredible review! These cookies are amazing! After tasting these, my mum was surprised to know that these are ragi cookies and do not use flour! It will be difficult to keep my hands off these and leave some for my son! I added pieces of a chocolate bar rather than chips and I guess they made the cookies chocolatey and fudgy, just the way I like them. And they are really easy to put together, took me only 15 min – which is an added bonus! Looks like these are going to be a regular feature in our kitchen going forward. Thanks for this recipe, Chhavi. These cookies are amazing – chocolatey and fudgy, just the way cookies should be! In fact, after tasting these cookies, my mum was surprised to know that these are Ragi cookies and do not use any flour / refined sugar. I’m completely floored by the taste and the ease of making these cookies – it took me a total of 15 min to put them together and 10 min of baking time. Considering that my son is know fully aware of the lure of chocolates and cookies, I know that these are going to become a regular feature in my kitchen. Thanks for sharing this recipe Chhavi, it’s a keeper! Hey hey! !Thankyou so much for a great review! I am so so so happy Avi loves them! How can I make these cookies without oven? Hey Saloni..I haven’t really tried making anything without an oven..